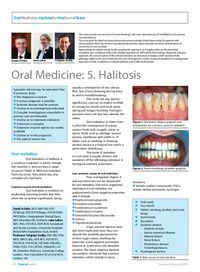 Abstract: This series provides an overview of current thinking in the more relevant areas of Oral Medicine, for primary care practitioners. The series gives the detail necessary to assist the primary dental clinical team caring for patients with oral complaints that may be seen in general dental practice. Space precludes inclusion of illustrations of uncommon or rare disorders. Approaching the subject mainly by the symptomatic approach, as it largely relates to the presenting complaint, was considered to be a more helpful approach for GDPs rather than taking a diagnostic category approach. The clinical aspects of the relevant disorders are discussed, including a brief overview of the aetiology, detail on the clinical features and how the diagnosis is made, along with guidance on management and when to refer, in addition to relevant websites which offer further detail. Author notes: David H Felix, BDS, MB ChB, FDS RCS(Eng), FDS RCPS(Glasg), FDS RCS(Ed), FRCP(Edin), Postgraduate Dental Dean, NHS Education for Scotland, Jane Luker, BDS, PhD, FDS RCS, DDR RCR, Consultant and Senior Lecturer, University Hospitals Bristol NHS Foundation Trust, Bristol, Professor Crispian Scully, CBE, MD, PhD, MDS, MRCS, BSc, FDS RCS, FDS RCPS, FFD RCSI, FDS RCSE, FRCPath, FMedSci, FHEA, FUCL, DSc, DChD, DMed(HC), Dr HC, Emeritus Professor, University College London, Hon Consultant UCLH and HCA, London, UK.